I read this article and found it very interesting, thought it might be something for you. The article is called Nearly A Third of India’s States/UTs Have Not Hiked Pay To Women Who Form Core Of Health Services and is located at https://archive.indiaspend.com/cover-story/nearly-a-third-of-indias-statesuts-have-not-hiked-pay-to-women-who-form-core-of-health-services-55926. As many as 11 states and four union territories (UTs) have not announced any change in the additional salary paid to anganwadi (courtyard shelter or creches) workers (AWWs) and anganwadi helpers (AWHs) since 2015, according to government data. India utilises the services of 1.18 million AWWs and 1.16 million AWHs under anganwadi services in the Integrated Child Development Scheme (ICDS), an early childhood care and development programme to improve health and nutritional status of children between 0-6 years. The number of AWWs dropped 7% to 1.18 million in 2016 compared to 2013. AWWs and AWHs are part time “honorary workers” from the local community who provide government services to children, pregnant and nursing women. AWWs and AWHs are already overburdened and underpaid for the various services that they are expected to render under ICDS. AWWs have been forced to shell out money from their own pockets due to delays. Nearly 40% of anganwadi workers surveyed in 2014 in six states had to use their personal money to run the anganwadi centre and 35% of them had not been paid on time, according to Progress of Children Under Six, 2016, report. In some states like Tamil Nadu, where the ICDS is robust, honorarium paid to the AWHs is higher than AWWs in Uttar Pradesh, added the report. The central government enhanced the honorarium of AWWs and AWHs by Rs 1,500 and Rs 750 per month–to Rs 3,000 and Rs 1,500 per month, respectively–with effect from April 1, 2011. States and UTs provide additional salary to AWWs and AWHs out of their resources. Delhi increased the total salary (including centre’s allocation) to Rs 9,678 for AWWs and Rs 4,839 to AWHs, the Times of India reported on July 22, 2017. The state government has also provided an additional Rs 500 and Rs 250, respectively, for internet/mobile charges, the Hindu reported on July 22, 2017. 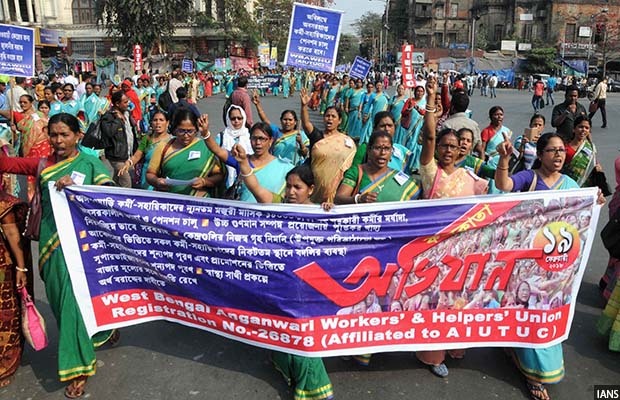 While Odisha hiked the remuneration of anganwadi workers from October 2017, Karnataka increased the salaries after protests by anganwadi workers. The wage increase in news report for states like Odisha and Kerala does not reflect in the government response in Parliament. Despite two email requests and as many calls over three weeks to the Ministry of Women and Child Development and the state government of Kerala on clarification of wages, we have not received any response. We will update the copy if and when we receive it.